The 'golden sovereign' (to coin a phrase) of Palenque, K'inich Janab' Pakal I lived through most of the seventh century AD and led Palenque out of the darkest period in its history to, by the time of his death, one of the most powerful and vibrant kingdoms of the Classic Maya world. K'inich Janab' Pakal I was born in AD 603, during a time of great peril for the Palenque kingdom. Just two months after his birth there was a possible attack on Palenque (see under Ix Yol Ik'nal), and then in AD 610-611 we are told that Palenque was attacked by the powerful kingdom of Calakmul and sacked; the future king K'inich Janab' Pakal I was barely eight years old at the time. K'inich Janab' Pakal I's mother was Ix Sak K'uk', and his father K'an Mo' Hix. 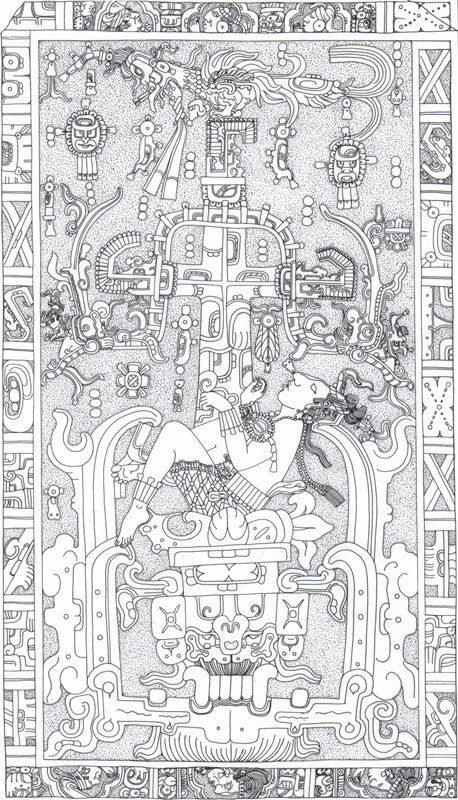 It is quite clear from the Palenque inscriptions that his royal claims were through his mother rather than his father. This in turn signalled an unusual succession, which among the Classic Maya was customarily through the patriline. The reason for the anomalous succession was likely linked to Palenque's military defeats, and the deaths of three Palenque royals (possibly four, if the problematic "Muwan Mat" is also counted) in the span of eight years around the beginning of K'inich Janab' Pakal I's life. Quite simply, K'inich Janab' Pakal I might have been the strongest claimant to the throne left alive after the attacks against Palenque. K'inich Janab' Pakal I acceded to the throne when he was just twelve years old, and the first years of his reign must have been extremely precarious. His mother, Ix Sak K'uk', appears to have ruled with him for a time as regent. Gradually, however, the kingdom seems to have stabilised and by AD 650, K'inich Janab' Pakal I appears to have consolidated his power. He spent the rest of his reign counter-attacking his enemies and rebuilding his capital city. His major military thrusts were aimed at consolidating Palenque's northeastern and eastern frontiers. 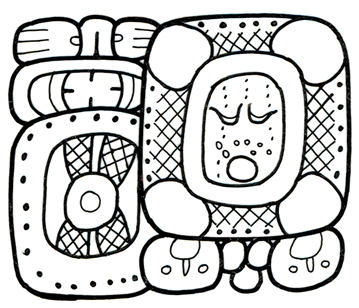 In AD 654, Calakmul led another attack against Palenque resulting in the "axing of Lakamha’". Very likely in reprisal for this attack, in AD 659 K'inich Janab' Pakal I attacked Pomona (probably a Calakmul ally) and carried off several of its lords for sacrifice. Pomona seems to have been a subject kingdom to Palenque for the rest of the Classic period. Similar wars were being waged to the northwest of Palenque by B'alam Ajaw, the lord of El Tortuguero, but the nature of his relationship with Palenque is still unclear. Major building programs undertaken by K'inich Janab' Pakal I were buildings in the Palace and the Temple of the Inscriptions. In the Palace, he built partly on top of some earlier buildings, which might have been damaged or destroyed by Calakmul in AD 611. The great king dedicated House E of the Palace in AD 654, House B (ca. AD 660), House C in AD 661, and probably House A around AD 670. He also commissioned the Olvidado Temple, about 1kilometer to the west of the Palace, and probably the Temple of the Count. K'inich Janab' Pakal I's crowning architectural glory was his funerary monument, the Temple of the Inscriptions. This impressive structure was built during the last years of his reign, and some of the sculptural elements were finished after his death by his son and successor, K'inich Kan B'alam II. The pyramid and its temple were built over the top of K'inich Janab' Pakal I's tomb, with a vaulted stairway leading from the tomb entrance to the rear chamber of the temple above. The discovery of the tomb represents one of the most famous finds in Maya archaeology: in 1952 the great Mexican archaeologist Alberto Ruz Lhuillier turned a large triangular slab of limestone at the tomb entrance and looked upon the magnificent stone sarcophagus that contains K'inich Janab' Pakal I's mortal remains. K'inich Janab' Pakal I died in AD 683 after a long and prosperous reign of 68 years. With his wife Ix Tz'akb'u Ajaw he had at least three sons, two of whom (K'inich Kan B'alam II and K'inich K'an Joy Chitam II) succeeded him on the throne of Palenque, and a third son (B'atz' Chan Mat) engendered later generations of Palenque rulers. K'inich Janab' Pakal I was held in great esteem not only by his sons, but by all subsequent rulers of Palenque. Indeed, many modern scholars have given K'inich Janab' Pakal I the epithet "the Great". K'inich Janab' Pakal I is one of the most documented of all Classic Maya individuals. In the List of Text References for him I have listed almost 100 entries, although it should be noted that some of these have been included as background information and do not specifically mention K'inich Janab' Pakal I. Based on past excavations, the next clearing of a temple at Palenque should uncover new inscriptions that should ensure that K'inich Janab' Pakal I will 'crack the ton', as we say in Australia. K'inich Janab' Pakal I is one of the most documented of all Classic Maya individuals. In the List of Text References for him I have listed over 100 entries, although it should be noted that some of these have been included as background information and do not specifically mention K'inich Janab' Pakal I. In eight occurrences, his name is spelled K'inich Janab'nal Pakal, and I believe that this may be a fuller and more accurate statement of his royal name. Nevertheless, I have kept his 'official' name for the Who's Who as K'inich Janab' Pakal I, partly in order to keep a logical sequence with the names of Janab' Pakal "the Elder", U Pakal K'inich Janab' Pakal II, and Wak Kimi Janab' Pakal III. Numerous portraits of K'inich Janab' Pakal I have survived. Many of these, such as the depiction of his apotheosis (a kind of deus ex mahk'ina) on the Sarcophagus Lid in the tomb below the Temple of the Inscriptions, show him idealised in youth.